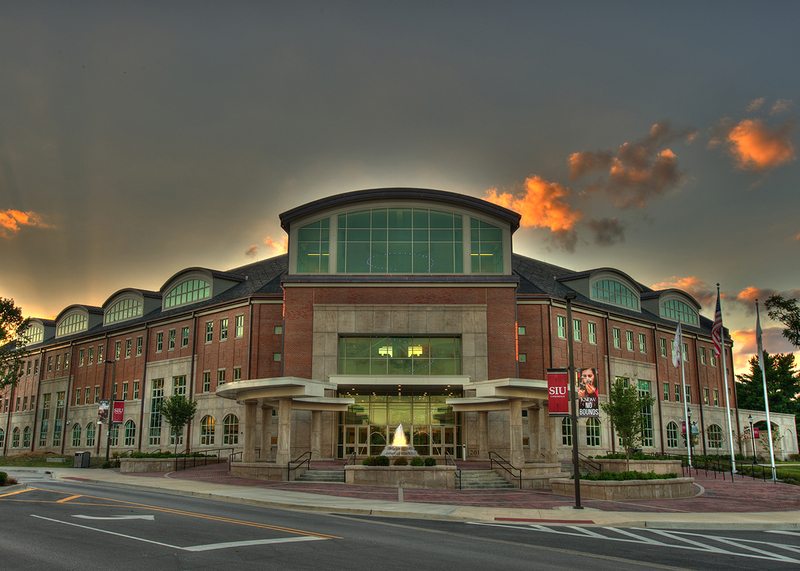 CARBONDALE, Ill. -- Southern Illinois University Carbondale will recognize 318 employees for their service to the university in a ceremony and reception Nov. 30 in Student Center Ballroom D.
The ceremony begins at 8:30 a.m. Registration starts at 8 a.m. in the John W. Corker Lounge. The event will honor employees with 10, 15, 20, 25, 30 and 35 years of service to SIU Carbondale. The employees have a combined total of 5,210 years of service to the university. There are 26 employees with 25 years of service, 15 employees with 30 years of service and five employees with 35 years of service. The following employees, listed by hometowns and years of service, will be honored. 20 years: Edward Jay Heist, Fisheries and Illinois Aquaculture Center and Zoology; Paula Sue Keith, Office of the President-SIU President’s Office; Russell Dee Orsburn, Physical Plant Service. 10 years: Donna V. Bennett, Graduate School; Stephanie Nance Vicenzi, Student Health Services. 15 years: Xiaoxin Wang Beardsley, Finance. 20 years: Cynthia Ann Casper, Student Health Services; John Philip Ligon, ASA Aviation Management and Flight. 20 years: Shane Ray Moore, Physical Plant Service; Sharon Norris Moore, Finance. 10 years: Ryan Kirk House, Department of Public Safety. 15 years: Beth Ann Mosley, Curriculum and Instruction. 20 years: Julie Kristen Davis, ASA School of Allied Health. 25 years: Richard W. Cole, Jr., Plant Biology. 20 years: Monica Lyn Russell, Economics. 15 years: Don E. Patton, MEDPREP/Medical Education Preparatory-School of Medicine, Carbondale. 20 years: Christopher Alan Pearson, College of Engineering. 10 years: Angela J. Aguayo, Cinema and Photography; Susan Jeannine Banning, Family and Community Medicine-Physician Assistant Program-School of Medicine, Carbondale; Mitchell Barlow, Physical Plant Service; Matthew A. Borowicz, Library Affairs; Laura Broms Boulukos, SIU Foundation Carbondale; Jonathon Daniel Brooks, Key Control; Lingguo Bu, Curriculum and Instruction; Amanda Jo Carsrud, Curriculum and Instruction; Joe L. Cheatwood, Anatomy-School of Medicine, Carbondale; Cynthia Marie Chester, Library Affairs; James A. Conder, Geology; Patricia A. Diggle, Office of Sponsored Projects Administration; Melodi Gayle Ewing, Student Health Services; Rebecca Allison Farmer, Registrar’s Office; Maria Claudia Franca, Rehabilitation Institute; Steven Charles Goetz, ASA Aviation Management and Flight; Tarnisha Green, Success in Engineering Through Excellence and Diversity; Erica Nicole Harris, University Housing; Afroza Hasin, Animal Science Food and Nutrition; Kanako Hayashi, Physiology-School of Medicine, Carbondale; Yuko Kato, School of Music; Richard Paul Russell Kelley, School of Music; Sun Kyoung Kim, School of Art and Design; Daryl G. Kroner, Department of Criminology and Criminal Justice; Michele Leigh, Cinema and Photography; Amber Terese Loos, Library Affairs; Robert Anthony Lopez, School of Art and Design; Leslie Alene Love, Achieve Program; Kenneth C. Matthias, Information Technology; Ashley M. Matzenbacher, Office of Sponsored Projects Administration; Marc Everette Morris, Accountancy; Christopher Wayne Mullins, Department of Criminology and Criminal Justice; Henry D. Nicolaides, School of Music; Michael R. Reis, Intercollegiate Athletics; Travis Dion Rice, Student Center; Aaron William Scott, School of Art and Design; Arianne Christine Smith, University Housing; Kevin R. Smith, Chemistry and Biochemistry; Margaret A. Stafford, Curriculum and Instruction; LaShonda Mashelle Stewart, Political Science; Stacia Loren Weinhoffer, Center for Environmental Health and Safety; Kelly L. Wicoff, SIU Foundation Carbondale; Amy Marie Wyatt, ASA School of Allied Health. 15 years: Angela Genise Anderson, Physical Plant Service; Ken Brian Anderson, Geology; Karen S. Baertsch, Linguistics; Andrew K. Balkansky, College of Liberal Arts and Anthropology; Zsolt Leslie Becsi, Economics; Sukesh Ranjan Bhaumik Biochemistry and Molecular Biology; Mark S. Byrd, Physics; Michael Cubley, Electrical and Computer Engineering; Janet B. Douglas, Information Technology; Ahmad M. Fakhoury, Plant, Soil, and Agricultural Systems; Thomas Bruce Flick, University Housing; Kimberly A. Gray, Kinesiology; Reza Habib, University Core Curriculum and Psychology; Ryan M. Hagler, Physical Plant Service; Justin Michael Harrell, Physical Plant Service; Bryan Todd Harrison, ASA Aviation Management and Flight; Frank Henry, University Housing; Susan Marla Howell, Library Affairs; Elizabeth Anne Hunter, Undergraduate Admissions; James Thomas Kidd, Theater; Eric Lenz, School of Music; James Allen Mathias, Mechanical Engineering and Energy Processes; Christina C. McIntyre, Associate Provost for Academic Programs and Curriculum and Instruction; Grant Eugene Morgan, University Housing; Seburn Levoy Pense, Plant, Soil and Agricultural Systems; Mark Schultz, School of Law; Amanda Jane Sutton, Undergraduate Admissions; Ha-Yee Teska, SIU Extended Campus; Gail A. Thomas, School of Law; Colleen A. Torphy, ASA School of Allied Health; Dawn Michele Vagner, SIU Foundation Carbondale; Edward C. Workman, Jr., ASA School of Information Systems and Applied Technology; Jian Xiong, Library Affairs; Chunhua Zhao, Intercollegiate Athletics. 20 years: Cheryl L. Anderson, School of Law; David John Anthony, English; Gary Allen Apgar, Animal Science Food and Nutrition; Nilanjana R. Bardhan, Communication Studies; Matthew C. Baughman, Office of the Chancellor; Doris Bell, Head Start Agency; Antony Sean Bittle, Library Affairs; Andrew D. Carver, Center for International Education; Rosalba Correa, Workforce Education and Development; Leonard K. Gadzekpo, Africana Studies; Tina J. Gerecke, Registrar’s Office; David Lynn Johns, Physical Plant Service; David M. Johnson, Languages, Cultures, and International Trade; Elaine T. Jurkowski, School of Social Work; Steven James Karau, Management; Sanjeev Kumar, College of Engineering and Civil and Environmental Engineering; Mary Jo Landt, Curriculum and Instruction; Joyce Ann Lee, Physical Plant Service; Tobias Lane Merriman, Information Technology; Marcus Dean Odom, Accountancy; Rachel Sue Price, Information Technology; Kusum Sharma, AIS Office; Stuart Alan Walters, Plant, Soil, and Agricultural Systems; Gregory Wendt, Center for Teaching Excellence; Jonathan Wiesen, History. 25 years: Timothy J. Fink, School of Music; Douglas P. Flummer, Information Technology; Laura H. Germann, Geography and Environmental Resources; Veronique C. Maisier, Languages, Cultures, and International Trade; Scott James McEathron, English; Erin Lee Palmer, School of Art and Design; Gerald Kent Richards, Information Technology. 30 years: Michael B. Behrmann, College of Applied Sciences and Arts and ASA Automotive Technology; Bidyut Gupta, Computer Science; Christi Lynn Ketzner, ASA Aviation Management and Flight; Lisa J. McClure, English; Sandra Lee Shea, Family and Community Medicine, Carbondale-School of Medicine, Springfield. 35 years: Eric Paul Mandat, School of Music; Rosanne M. Szekely, ASA School of Allied Health. 10 years: Charles Denis DeLaney II, Physical Plant Service; Patricia Lynn Erwin, Disability Support Services; Stella K. Kantartzi, Plant, Soil, and Agricultural Systems; Carrie Nicole Keith, Department of Public Safety; Jodi Lyn Miley, Physics; Shannon Lynne Newman, Information Technology; Everett C. Porter, Physical Plant Service; Lisa Ann Short, Electrical and Computer Engineering; Arlene Marie Transue, School of Music. 15 years: Brent M. Bany, Physiology-School of Medicine, Carbondale; Sandra K. Collins, ASA School of Allied Health; Paul Richard Deering, Student Center; Jennifer Lynn Fuller, Broadcasting Service; Holly J. Rick, Human Resources; Peter Andrew Rosenbery, University Communications and Marketing; Dawn Erin Sisk, Physical Plant Service; Ralph Finley Tate, ASA Automotive Technology. 20 years: Steve L. Jackson, Undergraduate Admissions; Gina R. McCann, Curriculum and Instruction; Stacy Lynn Peach, Human Resources; Thomas Michael Smith, Physical Plant Service; Deborah Lynne Stroud, Information Technology. 25 years: Kyle Lee Lake, University Communications and Marketing; John Mann, University Communications and Marketing; Diane M. McClain-Inman, School of Art and Design; Lynne A. Westra, College of Business. 30 years: Sonjie Ann Schwartz, Office of Sponsored Projects Administration; Warren Lee Snider, Information Technology; Toni Gale Vagner, Library Affairs. 10 years: Teresa J. Sherk, Zoology. 20 years: Alethea Renee England, Information Systems/Carbondale-School of Medicine, Carbondale; Kimberly Gail Prater, Office of Teacher Education; Jennifer Marie Stillman, Bursar. 25 years: Carroll Glen Walker, Center for Teaching Excellence. 20 years: Patti L. Cludray, Forestry; Charlie W. Cox, Accounting Services. 10 years: Jamie Qualls, Records Management; Stephen R. Sinkhorn, Information Technology; Satoshi Toyosaki, Communication Studies. 15 years: Beth E. Dallas, Information Technology; Allison Rae Sutphin, Medical Library/MRC-Carbondale-School of Medicine, Carbondale. 20 years: Kenneth G. Howard, Physical Plant Service; Craig Jackson, University Housing; Louisette Charlaine Plath, Counseling Center; Brian Lee Skouby, Information Technology. 10 years: Patricia Ann Cochran, Registrar’s Office; Sandra Kay Meacham, College of Science; Benjamin Alan Miller, Student Center; Larry E. Sims, Registrar’s Office; Joshua Richard Wilson, Bursar; James Thomas Wright, Jr., Physical Plant Service. 15 years: Wade A. Mydler, Physical Plant Service. 20 years: Tamara Lynn Carson, Vice President for Financial and Administrative Affairs-SIU University-wide Services; Ella Isabelle Ginn, Property Control; Victoria J. Macaluso, Center for International Education; Christina Marie Rowell, Institutional Research and Studies; Diana Lynn Tilley, University Housing. 25 years: Christine A. Barker, Alumni Services. 15 years: Kathryn Yvonne Martin, Rehabilitation Institute. 10 years: Kimberly Anne Morgan-Bernardini, Plant and Service Operations. 20 years: Melissa Ann May, Undergraduate Advisement. 10 years: Brent Alan Robinson, Physical Plant Service; Betty J. Rouse, Procurement Services. 15 years: Vicky Ann Pearce, Curriculum and Instruction. 15 years: Patti J. Deskines, Plant, Soil, and Agricultural Systems. 10 years: Amber M. Armstrong, Recreational Sports and Services; Garth Valentine Crosby, Technology; Carey Lynn Russell, Physical Plant Service. 15 years: Lisa C. Caringer, Disability Support Services; Edward J. Helleny, Radio, Television, and Digital Media; Elizabeth Michele Spezia, Broadcasting Service. 20 years: Tammera Lynn Baumgarte, Plant and Service Operations; Melissa J. Marlow, School of Law; Kevin Sylwester, Economics. 30 years: Karla Jean Rankin, Undergraduate Admissions. 10 years: Brett B. Corse, Office of Sponsored Projects Administration. 10 years: Jennifer Aileen Donow, Physical Plant Service. 30 years: Jane Ann Meuth, Clinical Center. 30 years: Edward G. Pultorak, Jr., Curriculum and Instruction. 15 years: Donald Gene Bixler, Head Start Agency. 10 years: Ted William Grace, Student Health Services; Travis Derek Janssen, School of Art and Design; Rose M T Moroz, Graduate School; Stephanie Renee Ritter, Student Affairs-School of Medicine, Carbondale. 15 years: Deborah A. Bruns, Counseling, Quantitative Methods, and Special Education; William R. Bruns III, Student Center; Peter Eric Rowan, Information Technology; Jennifer Leigh Sykes, Curriculum and Instruction; Denise Jarrett Zaczek, Physiology-School of Medicine, Carbondale. 20 years: Craig S. Gingrich-Philbrook, Communication Studies; Daniel J. Richardson, College of Applied Sciences and Arts; Tina M. Shingleton, Alumni Services. 25 years: Bhaskar Bhattacharya, Mathematics; Shari H. Garnett, Student Center; Rebecca A. Jarvis, Evaluation and Developmental Center. 30 years: Randall J. Greer, Information Technology. 10 years: Brian William Bolte, Physical Plant Service; Melissa K. Gibbons, Office of the Provost and Vice Chancellor for Academic Affairs; Jean Karen Stift, Center for International Education. 15 years: Jennifer Dawn Nadeau, Accounting Services; Scott Dee Sprague, Physical Plant Service; Duane Stucky, Vice President for Financial and Administrative Affairs-SIU University-wide Services; David Earl Whitsell, University Housing. 20 years: Mary L. Bogumil, English; Diane Fern Fritcher, Mathematics; Steven J. Lazorchak, Physical Plant Service; Michael R. Molino, College of Liberal Arts and English; Chad Clayton Waters, College of Applied Sciences and Arts. 25 years: Tracy Ann Bennett, Labor and Employee Relations. 15 years: Angela Dawn Darnell, Curriculum and Instruction; Kelly J. Garrett, Physical Plant Service. 10 years: Kimberly A. Labonte, Internal Auditor-SIU University-wide Services. 10 years: Benjamin Michael Anderson, Information Technology; Alex J. Bame, Physical Plant Service; Kimberly Ann Baskin, Student Health Services; Danny Jack Cochran, Physical Plant Service; Paul E. Echols, Department of Criminology and Criminal Justice; Stephen B. Hall, Campus Mail Service; Jason R. Hill, SIU Extended Campus; Steven Paul Hudson, Physical Plant Service; Farid A. Kadyrov, Biochemistry and Molecular Biology-School of Medicine, Carbondale; Nathan Leo Krummel, University Communications and Marketing; Michele Leigh Mekel, School of Law; Jill Lorraine Mueller, ASA Off-Campus Academic Programs; Michelle Lynn Schmid, Bursar’s Office; Dana Marie Shepard, Curriculum and Instruction; Scotty Lyle Stanley, Physical Plant Service; Fredrick David Stull, Physical Plant Service. 15 years: Loretta Battaglia, Plant Biology; Michael Duwain Brazley, ASA School of Architecture; Cade Bursell, Cinema and Photography; William J. Fiedler III, Library Affairs; Qingfeng Ge, Chemistry and Biochemistry; Barbara Ann Jones, University Communications and Marketing; Mandy L. King, Office of Sponsored Projects Administration; Cynthia Shea Massey, SIU Foundation Carbondale; Diana Jean Murphy, Curriculum and Instruction; Benjamin F. Rodriguez II, Psychology; Charlene L. Summers, Student Center. 20 years: Elizabeth A. Clover, Financial Aid Office; Bradley Shawn Cowley, Physical Plant Service; Mary Elizabeth Dowdy, Registrar’s Office; Scotty Sean Dunning, Student Center; Kimberly A. James, ASA School of Allied Health; Roseann Romero, Curriculum and Instruction; Ian Michael Ruark, Rehabilitation Institute; Linda D. Wright, SIU Foundation Carbondale; Steven T. Zak, Office of the President-SIU President’s Office. 25 years: Jana J. Bateman, Student Health Services; Georgia Anne Beasley, Information Technology; Michele Lynn Hines, Flight Services; Tomas Velasco, Technology. 30 years: Donna J.C. Brantley, Bursar; Maurice J. McCann, Finance. 35 years: Bruce A. Devantier, Civil and Environmental Engineering; Laura J. Sims, Communication Studies. 15 years: Connie Morgan, Curriculum and Instruction. 20 years: Steven Charles Ginn, Student Center. 20 years: Lori Renee Amerman, Office of Economic and Regional Development; Sean Timothy McDonald, Physical Plant Service. 10 years: David Loy Tippy, Physical Plant Service. 15 years: Phillisa Ellen Tyner, Traffic and Parking. 25 years: Karen Elaine Moskoff, Student Health Services. 10 years: Shannon Lynn McKee, Curriculum and Instruction. 15 years: Linda Renee Baker, Paul Simon Public Policy Institute. 10 years: Harold W. Wasson, Construction Management Services. 25 years: Catherine J. Yeager, Human Resources. 15 years: Amelia K. Vick, Plant, Soil, and Agricultural Systems. 15 years: Linda Marie Eaton, Curriculum and Instruction. 25 years: Michele L. Clem, Curriculum and Instruction. 10 years: Cecilia M. Porter, University Core Curriculum. 10 years: John O’Leary, Physical Plant Service. 15 years: Cassandra Jill Laswell, Curriculum and Instruction. 30 years: Dawn M. Moake, Information Technology. 15 years: Stephanie Lee Jones, Curriculum and Instruction. 10 years: Pamela Jo Battaglia, College of Education and Human Services. 15 years: Douglas Dean Owens, Workforce Education and Development. 10 years: William A. Babcock, School of Journalism. 25 years: Michael F. Costello, Technology Off-Campus Degree Programs. 10 years: Richard Daniel West, Physics. 15 years: Peter J. Fadde, Curriculum and Instruction. 10 years: Douglas E. Worthen, School of Music. 10 years: Christopher Martin Wienke, Sociology. 15 years: Andrew Youpa, Philosophy. 35 years: Robert Alan Hahn, Philosophy.